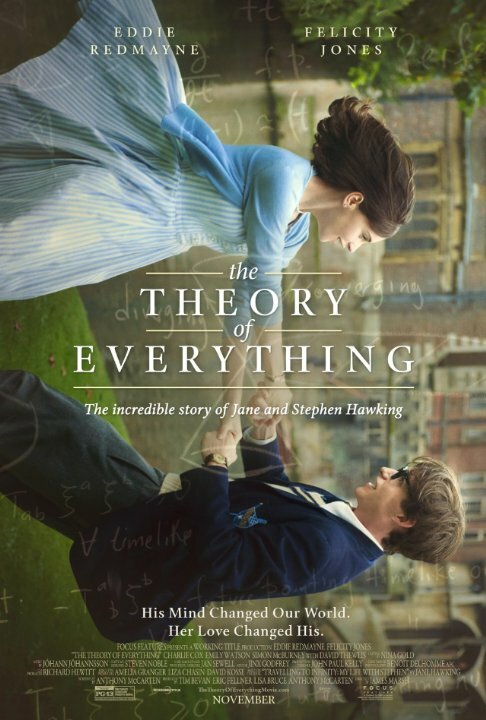 “The Theory of Everything” is the story of a man who’s achieved complex and extraordinary things under the most challenging of circumstances, but the most extraordinary thing about this movie, is its simplicity. It’s wonderfully refreshing. It turns out, Stephen Hawking’s (Eddie Redmayne) story is just about as incredible as his achievements in the world of theoretical physics. But just as incredible is the strength and patience of the woman who stood by his side Jane Hawking (Felicity Jones), his first wife. This movie is after all based on her memoir, “Travelling to Infinity: My Life with Stephen.” a fact that you might not catch if you didn’t know it going in. This movie, for obvious reasons centers around the Stephen himself. He is the protagonist of this tale. So, I’m going to dedicate this review to some praise for his better half, who is portrayed by the wonderful Felicity Jones. I will say,the praise being put upon Eddie Redmayne for his performance is most definitely deserved. He’s brilliant in a role that’s completely speechless for most of the film. He is wonderful. Felicity Jones as Jane is the perfect companion (and rightfully nominated). It’s a much simpler, subtler performance, and it’s perfectly fitting of the character. Just as all that Jane does is in service of this incredible man that she loves, the performance of Eddie Redmayne could not shine without the steadfastness of Felicity Jones. It’s the perfect match, and wonderful work by both of them. They are the heart and soul of this film. Of all of the nominated films this season, this was definitely one of my favorites. It’s an extraordinarily simple telling of an extraordinary life. It’s beautiful, visually, and in the story that it’s telling. Most importantly, and this was surprisingly common among this year’s best picture nominees, it’s a movie that you just might want to watch again (and maybe even again).